St. John Neumann officially turned 200 years old in March of 2011, but the Redemptorists continue to celebrate this milestone through June of 2012. 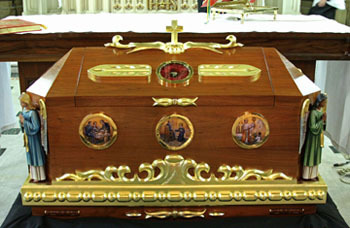 The traveling relics of St. John Neumann will be in Susquehanna and Scranton, PA, next week visiting two parishes with significant ties to this first male American saint. In October, the relics will head a little further south to Bloomsburg, PA, as part of a parish mission being preached at St. Columba by Father Richard Boever, a Neumann expert. Other events on the relic calendar this fall include engagements in Riverside, NJ, Lebanon, PA, and Elkridge, MD. For more information about the relic tour, see a complete calendar at redemptorists.net/neumann. St. John Neumann was a passionate promoter of the Forty Hours Eucharistic Devotions, a practice he popularized in the United States. Several Redemptorists will be preaching at Forty Hours celebrations in Pennsylvania and Maryland this fall as part of the Neumann Year celebration. Other ongoing Neumann Year events include our second annual Neumann Essay Contest, open to Catholic school students nationwide in grades 6-12; the celebration of Neumann’s feast day on January 5, 2012; and the close of the Neumann Year in June. For up-to-date information on the Neumann Year, visit redemptorists.net/neumann.